Telecom service providers are embracing open source software and are moving beyond trial deployments. Moreover, they're seeking ways to free themselves from the technology constraints and associated costs of maintaining legacy networking equipment. Three-quarters of carriers participating in a survey of software-defined networking (SDN) technology demand say they've already deployed, or will deploy, in 2016 -- plus, 100 percent say they plan to deploy at some point in the future. According to findings from the latest survey of carrier SDN strategies by IHS Markit, it’s clear that service providers around the globe are investing in SDN as part of a larger move to transform their infrastructure, internal processes, operations and service offerings. Informed telecom service providers believe that SDN will fundamentally improve network architecture and deliver substantive benefits in service agility, time to revenue, operational efficiency and Capex savings. Survey respondents report that their top three SDN-targeted network domains for deployment consideration by the end of 2017 are within data centers, between data centers and access for businesses. Most start cautiously with SDN, targeting small parts of their networks called “contained domains” in which they will explore, trial, test and make initial deployments. That said, IHS Markit analysts believe that it will take time before entire telecom networks are controlled by SDN technologies. However, there are a few forward-thinking global network operators already planning major, comprehensive SDN deployments -- such as AT&T, Level 3, Colt, Orange Business Systems, SK Telecom and Telefónica. IHS Markit says that the industry is still in the early stages of a long-term transition to SDN and network functions virtualization (NFV). Respondent operators indicated that their top barriers to deployment are the lack of carrier-grade vendor products and integration of virtual networking into their existing infrastructure. Regardless, survey respondents rated virtual customer premises equipment (vCPE) managed services as the top SDN and NFV related application, specifically as a new source of telecom service provider revenue. 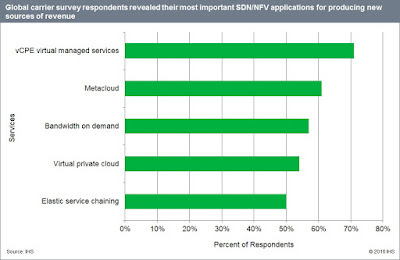 Survey participants also report that some SDN/NFV apps are not being adopted as expected, and telecom equipment vendors and software suppliers need to invent new approaches that create more added-value.